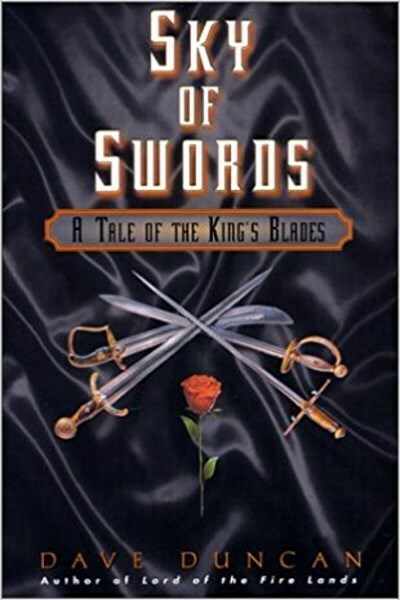 Read my review of Sky of Swords. 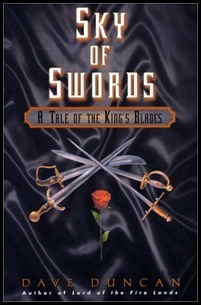 Sky of Swords by Dave Duncan is the third novel in the King's Blades series. 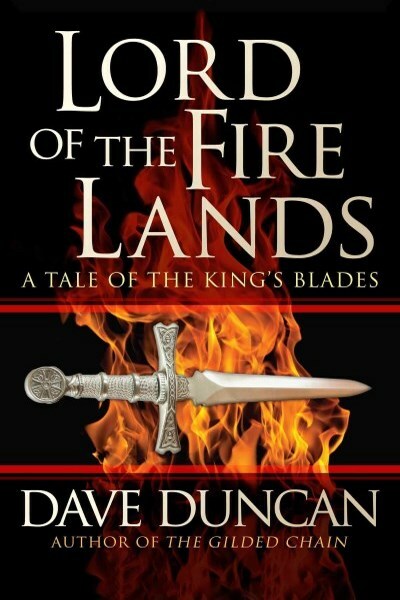 In book two, Lord of the Fire Lands, the reader is left hanging at the end as history inexplicably unfolds in a different fashion compared to what was told in the first novel in the series. Duncan not only has some explaining to do, but, as a writer myself, I was curious to see how he was going to handle this inconsistent situation. I wasn't disappointed in the storytelling or the characters, but I was a little at the ultimate conclusion. Still, I'll give the author some credit: it was something you don't often see done in a fantasy novel, and while I did see where things were going about halfway through, the ride getting there was still fun. In this installment our point-of-view character is Princess Malinda, daughter of the King of Chivial, which is the principal realm we are concerned with in book one of the series. Similar to how Lord of the Fire Lands was laid out, the story is part past, part present, but always told from Malinda's viewpoint. The novel opens with Malinda locked in prison, accused of high treason against the king. Of course, we know from the second book that the king, her father, is dead, and so the question of who is the current king is just one of many as the story unfolds. It's interesting that Duncan chose Malinda as the primary viewpoint character. While she shows up in the previous two novels, it is mostly as cameo roles. In those, she is depicted as a spoiled child with little depth. This changes in Sky of Swords as she is forced to grow up fast or crumple beneath the political and royal weight laid upon her. Durendal (the hero and main character from the first novel) once again is present, this time as a secret advisor as Durendal must fear for his own life: Calls for the disbanding of the Blades grow louder after the king's death; anyone associated with them past or present must be wary. But Malinda casts a bold strike when she Binds four Blades to her, thus creating a group called the Princess's Blades. Sky of Swords is an adventure novel first and foremost, but contains more court and political drama than the first two novels as Malinda must contend for the throne with a cousin and half-brother. Malinda is a likeable character whose personality we learn is quite different from her previous portrayal as we come to realize Duncan's characters are not always the most reliable narrators. I liked Sky of Swords, but I did find the final solution to setting things right a bit of a letdown. Not to give anything away, but it was a very Superman-like ending. Still, it was a fun read and I'm looking forward to jumping into the next novel, Paragon Lost . Read my review of Lord of the Fire Lands. muniment: A record; the evidences or writings whereby a man is enabled to defend the title to his estate; title deeds and papers. It is then, as the novel concludes, that Duncan drops his bomb. I won't go into what it is, as giving it away could be considered a bit of a spoiler. But it's significant enough that I immediately started reading the next novel in the series, Sky of Swords . My impression of Duncan continues to improve with this latest novel. His stories are enjoyable, engaging, and very well-written. He tends to use a lot of words from Old English; my Kindle's built-in dictionary is perhaps its best and most used feature. I started reading Sky of Swords immediately after finishing Lord of the Fire Lands and, in fact, just finished it this morning. Look for that review next. 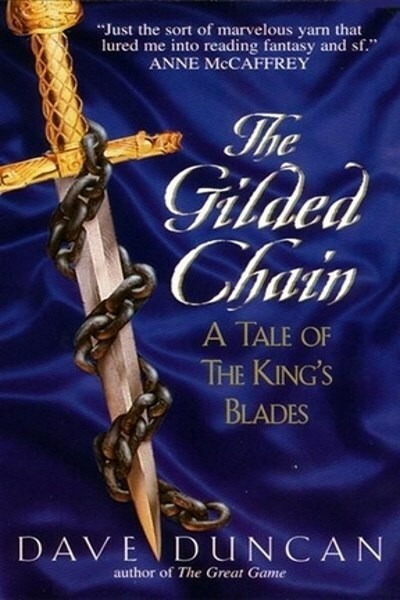 The Gilded Chain by Dave Duncan is the first in his six book King's Blade series. While the story in each novel takes places in the same world, each work stands alone as a tale unto itself. This first book tells the story of Durendal, a waif with little future who is recruited to become a King's Blade, a swashbuckling swordsman bound by magic to serve either the king or whoever the king so chooses. The enchantment is important as it defines the identities of the Blades as a whole. It goes beyond mere allegiance as each Blade is bound magically to protect, serve, and always hold their ward's safety and life in the highest regard. Blades do not sleep, they can stomach only one glass of wine when on duty, and they look upon everyone with suspicion or at least as a potential threat. They do not do this willingly; the enchantment makes them. While there is great loss of freedom in choosing to serve as a King's Blade, it is also considered the highest honor. Durendal is, of course, special. It is a common practice for each Blade to take the name of a previous Blade and, in doing so, aspire to live up to the previous Blade's deeds. There is one name, Durendal, that none will take for the bar was set too high when that first Durendal served. Not so for our young hero as he claims the name for himself and not only meets the challenge but far exceeds it. What begins as a bit of a predictable tale, with Durendal bound to a nothing lordling, does an about face when that lordling is killed early on. The tale picks up from there, introducing a completely different tale from what one expected based on the book's summary. This works out for the best, for Durendal is sent to learn the whereabouts of a missing Blade and to unravel the mystery of a gladiatorial arena where the gladiators cannot be killed. I've been reading a bit of Duncan's work lately, namely The Alchemist series of Venetian fantasy/mysteries, which is one of his more recent works. The Gilded Chain goes back a bit to 1998. It's interesting to note the differences in style between this book and Duncan's more recent novels. I can see signs of maturation in both the author's ability to tell a tale and in his writing chops. Regardless, The Gilded Chain is exceptionally written, with a good balance of endearing characters, plot intrigue, adventure, and even a bit of mystery. Duncan does an excellent job of bringing the overall story full circle with a bit of a twist ending that I did not see coming. The Gilded Chain is a fun read and I'm looking forward to picking up the next book in the series.